Our AGM has been postponed due to some legal difficulties we were made aware of when we had our legal team examine a number of procedures. So in order to be fair to everyone and on legal advice we decided to postpone our AGM until March. We will be in a position to inform and ensure that all procedure is correct by that date. The Board would like to assure all those who have put their names forward to be elected that once the legal anomalies have been addressed , all eligible nominations will be held open and put before the newly convened AGM. We will be in touch with all nominees, before the AGM. If this has caused you, any inconvenience then on behalf of the Board our sincere apologies. We will be getting in touch with you in February 2013 with the proper procedure leading up to our AGM. Our AGM is being held in Galway this term, as it was held in Waterford last year. Next year we intend to hold our AGM in Limerick and the year after that in Cork. We recognise that all our members deserve a chance to attend our AGM at some stage in their areas. It is fair! This just leaves me to wish all our members/and those who accessed our services this year a happy healthy and prosperous Christmas. From the Board, and all our staff, thank you for your support and good wishes in difficult times. The only people eligable to attend an AGM meeting of the Organisation are members. As such letters were only forwarded and sent to those who are on our database at present and those who, over the last year, have filled out a membership application form and had their membership confirmed. Why is the AGM being Held in Galway? As our organisation has grown over the last two years and more and more people contact us requesting assistance/help we are intent on ensuring every member has access to an AGM in their Region. Previously all AGM's were held in one city and this was to the detriment of those who lived outside that area. As a result We had our AGM in Waterford Last year and we will have our AGM in Galway this year. It is our intention to continue to move the AGM around to the regions we support so as to make it available to members within that region. I am not a member can I attend the AGM? If you are not a member of Right of Place Second Chance you cannot attend our AGM. This is normal practice. That being said we have a number of meetings scheduled for next year to inform, to update and to make available our resources and these meetings will be open to ALL Survivors whether they are members of Right of Place or not, but an AGM meeting is specifically for members. So I am not a member, can I access your services? The answer to this question is crucial and one that has been answered numerous times. You do NOT have to be a member of Right of Place Second Chance to access our range of services. There is no pressure on you to ever become a member of Right of Place Second Chance and you will never be asked to become a member, unless you wish to vote at AGM's or receive our Quarterly Newsletter. Membership is not a neccessity but a choice! So if you have no interest in becoming a member (as is your choice) then that does not exclude you from receiving help and assistance, so please call us for non judgemental, confidential and trustworthy information, advise and assistance, regardless of your membership status! So what are the benefits of Being a member? The ONLY benefits of being a member of Right of Place Second Chance are you can attend and Vote at AGM's and you receive a quarterly Newsletter from us. These are the only benefits. We have many lines of communication within Right of Place Second Chance, Phone, Website, e-mail, letter, Offices and all of these can be used to verify if you are or are not a member. Personally the fastest and most efficient way is to call one of our Regional offices (details of their contact number can be found by clicking here) and the Outreach Manager will verify this and call you back. Listed below is a copy of our complaints/suggestions procedure. We are aware there is many improvements we can make as an organisation and many ways we have of developing. As such we value any comments/suggestions to improve Right of Place Second Chance and each letter is taken with the utmost of respect and confidentiality. We want to ensure you are aware of the processes that exist. So please feel free to use these avenues now and into the future, as some of our clients already have. 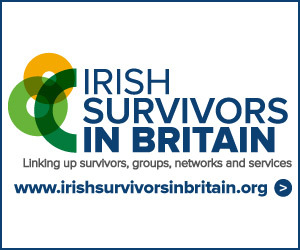 Important Website (Please take a look) "Irish Survivors in Britain"
In what has become an important time in the Journey of Survivors the ability for those supporting them, to co-operate, to share best practice and to create links for the betterment of Survivors lives has to come. With the introduction of the below website, which links up the different Survivor services in Britain to great effect, this process has begun. Survivor support services for the first time have been categorised and listed in one common area and the Federation of Irish Societies deserve tremendous praise for the work they have done in relation to this. This information is important for you, for any friends/family members you may have living in the UK and crucial to the ongoing development of a unified support services, with one goal in mind - to provide the best Supports to Survivors and their families. "This website is for Survivors of institutional abuse in Ireland, who are now living in Britain. It is part of a wider project supporting a network of survivor groups and services, supporting people wishing to form survivor’s support groups, publicising events, providing information useful for isolated survivors or their families not already linked in, and raising awareness more generally. The site is administered by the Federation of Irish Societies. Linking, supporting, connecting survivors." Please Click on the Below image to load website. Alternatively click here to view website. This week marks Mental Health Awareness Week. So what is it and what can you do? 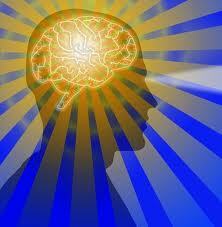 Mental Health is defined, as per the World Health Organisation as; "a state of well being in which the individual realises his or her own abilities, can cope with the normal stresses of life, can work productively and fruitfully, and is able to make a contribution to his or her community". So, by that definition it is safe to presume we can all suffer a little from Mental Health and it is one of the most common of all health conditions. For most individuals 'depression' is a factor we all face at some time in our lives, through many factors and many reasons. Many of us have the capabilities of overcoming these, for many reasons, whilst some do not. What about those who do not have the capabilites of overcoming a feeling we all experience? Many feel there is a stigma attached to feeling "depressed" or feeling "low" and often people have nobody to talk to, to listen to them or to share their problems with. They continue to suffer in silence constantly caught in a struggle with their emotions. Indeed many individuals may seem to be able to take things in their stride and manage the situation, but underneath they are being torn by anger, pain, hurt and lonelieness. So how does this effect Survivors of Institutional Child Abuse? It is commonly known and understood that experiences of Childhood Abuse, doubles your risk of suicide, and whilst there is no research, as of yet, into Institutional Childhood Abuse, I am sure that figure is even greater. Anecdotally through our front-line support we have spoke to many Survivors who can recall, friends and family who have committed suicide struggling to cope in their everyday lives and/or struggling to cope with the pain of the past. So what can we (as an organisation) and you as individuals do? Right of Place Second Chance, since establishing ourselves from the previous Board of Directors have undertaken some seismic changes within the organsisation. Many of these changes have been completed and some are still being developed. Our aim has always been to offer practical every day support to Survivors of Institutional Abuse and their families. When the new Board of Directors were democratically elected to Right of Place and changed direction, we were aware how monumental the task we were going to undertake was. Despite this knowledge all of us became involved and passionate about what we were (and will continue to) do for Survivors because we only need look at Survivors history to know they were never treated fairly and justly. We wanted and want to change this. We looked at the History of Right of Place and how despite it's best efforts, times had changed and Right of Place failed to change with them. The supports that were offered by our organisation, did not match the actual needs of Survivors and this left many angry and disillusioned with the services on offer. 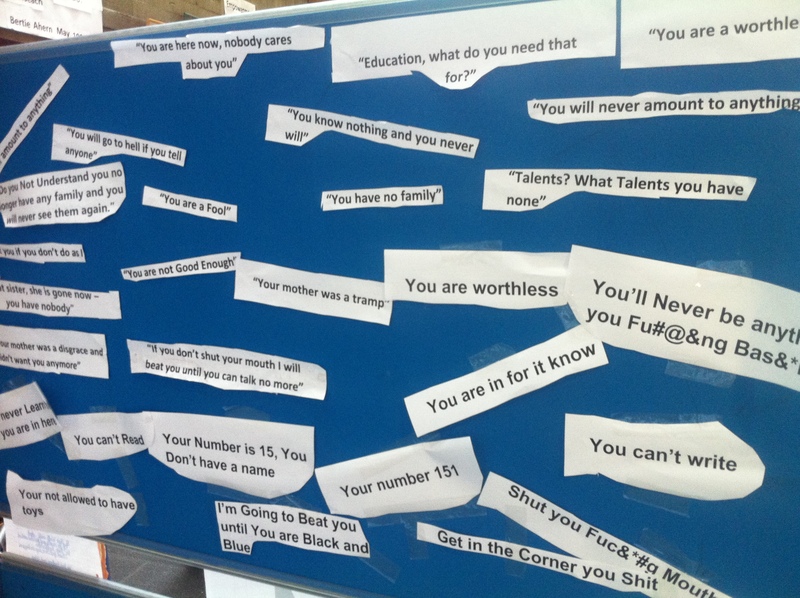 Many Survivors voiced their concerns and many were listened to. We needed to offer more services, to more people and allow access to supports across the country. It is safe to say, from the (record) numbers that contact us, we largely achieved this. We achieved this, despite a cut of over 45% in our budget within a 24 month period. So how did we achieve this, what did we change / enhance within the organisation? The above are just to name a few. The main difficulty we have, is that depsite the obvious understanding that we are working well within our budget, the legacy issues we were forced to deal with from the Previous Board of Directors has eaten into our existing budget. It is with this in mind and to ensure that we as an organsiation survive into the future the difficult decision has been take to reduce the hours off all staff within Right of Place Second Chance. This decision has not been taken lightly as we are already aware that demand far outweighs what we had available so we are forced to again ask for your patience and understanding that for the foreseeable future there may be a delay in responding to your enquiry. This will be reviewed on a month by month basis. The necceisty on us to fundraise over the coming months is crucial as if we do not, the organisation may not remain open into next year. The Survivoral of the organisation is much more important to all staff as we see and understand the work that goes on, the potential for growth and the ultimate impact we have and could have to Survivors and their families so we will do everything in our power to overcome these difficulties that are a result of one off costs associated with Legacy issues. All staff would like to thank all Survivors and Supporters for their continued support during these difficult times. Any Further changes, you will be kept fully appraised. Are Those responsible for the devestation of lives living up to their responsibility? We recently spoke with the Composer and Singer/ Songwriter of the below video. His story, and that of which the song is dedicated, shows a very real explanation of why Survivors need to be supported. JJ was just a boy when they took him away. 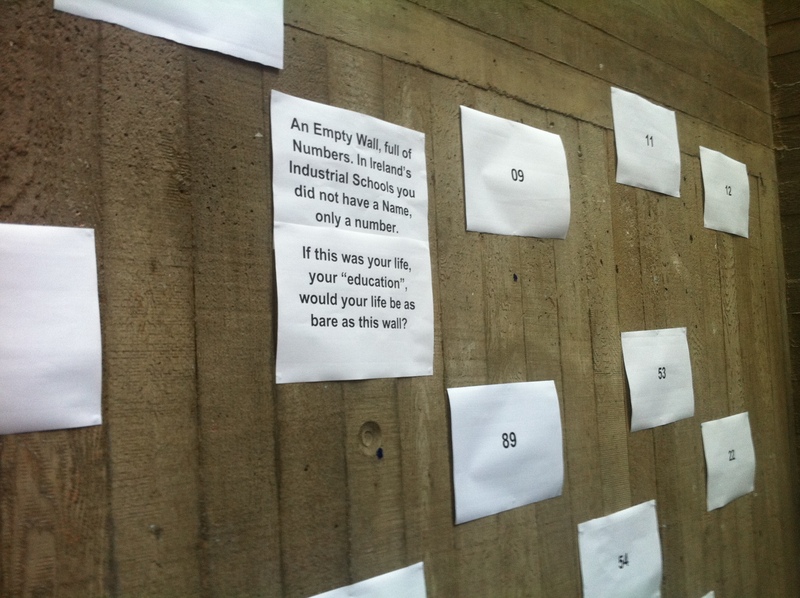 Took him from all that he knew and all that he loved and sent him to one of Ireland's Industrial Schools. Whilst JJ was in one of these industrial schools, he was raped. Raped by somebody who was meant to care for him, who was meant to help him. A child, taken away from all he knew, beaten and raped. When JJ left this institution he couldnt cope with the scars that were left on him. Little support, few who understood him and a life of never being able to speak out. JJ turned to the only thing that he could - he used drink and drugs as a coping mechanism. JJ used this coping mechanism, tried to live with the scars, but eventually passed away. JJ died, a one bedroom flat, no family and lonely from Social Isolation. How different could JJ's life have been were it not for our state and the abject failure to protect JJ and thousands like him. Jaygo Purcell a wonderful Singer/Songwriter produced the following to honour the memory of JJ and promote his harrowing story. Please take a look, have a listen and share with others. Thanks Jaygo for helping to create awareness. Survivors MUST NOT be allowed to be forgotten! Their priority in supports must begin and begin NOW. How many more JJ's are out there? The above video is the sole and exclusive property of Jaygo Purcell and we thank him for giving us permission to use it. Survivors of Institutional Abuse hold a unique and distinct place in modern Irish History. Generations of Irish Children were sentenced by the courts in this country to “serve” varying degrees of years in one of Ireland’s Industrial schools. Many of these children were amongst Irelands most vulnerable. They looked for care, for love, for compassion and most importantly basic Human Rights. Many if not all of these, whilst they were in the care of our state, had their basic Human Rights cruelly and brutally taken away from them. Their right to proper education, a safe place to live, proper healthcare and adequate food were denied. All lived in constant psychological fear, all were forcefully beaten and many were raped as children whilst in the care of the state. When these children eventually reached an age where they could be free of this continued abuse, they left Irelands Industrial Schools with little education, limited life skills, harrowing memories and years of constant denigration ingrained into their minds and bodies. Many went on to litter the many Institutions across Ireland and further afield, struggling to cope with years of brutal mistreatment and the mental Institutions, our streets, homeless shelters and prisons bear testament to this, in a word many became; institutionalised. Many who had the courage to speak of their experiences were ignored, dismissed as being “liars” and or “trouble makers”. They were kept silenced in some cases for nearly 40 Years. This ruined relationships, broke down marriages and split families, as they could not understand why their loved one was unable to show affection. If you had this beginning in life how would you rate your chances of gaining an education, being able to hold onto relationships, providing a definitive future for you and your loved ones or having equal opportunity for employment? Would you need additional assistance as an adult, still struggling to cope with the pain of a childhood lost, from the very state that caused you so much pain as a child? It is natural as Irish people, who at our very core are naturally generous, understanding and compassionate to appreciate the importance of supporting Survivors and their families as they reach their twilight in life, offering them some form of priority in their basic Rights. Why then do Survivors of Institutional Abuse still suffer through prolonged access to their basic Human Rights, merely being considered as another statistic? Through our frontline work with Survivors of Institutional Abuse, basic Rights such as Housing, Welfare and Health are being denied and prolonged to Survivors and their family members. Feelings of pain, anguish and mistrust are being re-ignited in Survivors life’s by this basic denial to offer Survivors a Priority of Service in areas they never had an opportunity to develop, due to their disadvantaged beginning. Our average completion rates in reaching a successful conclusion on a Survivors journey over a 90 day period is nearly 75% for the majority of supports needed. When this same statistic is compared with Housing and Welfare / Health the figure equates to 20% and 32% respectively. This reflects poorly on a state who is failing in its obligation to adequately support the very people they failed to support as children. This is simply not good enough. We must ensure that these are improved and through simple steps, such as a designated contact in each of the Housing and Welfare departments in every corner of Ireland, a published Newsletter 4 times a year, with information on Survivors needs to ensure these contacts are privy to information when dealing with Survivors. Additionally a yearly Forum where people / organisations who have an effect on Survivors lives can share knowledge and best practice. It is with this in mind that I write this piece, calling on the Government to initiate and the public to support nominating Survivors and their families as a unique citizen Group in Irish Society. This could be cost neutral and ensure that Survivors have the ability to live the remaining years of their lives with some dignity, respect and understanding that we as a people are truly sorry for our Government and states failure to protect our most vulnerable in their time of need. This time of need has not concluded and we must appreciate this. Until every Survivor (and family member) has the opportunity and priority access to housing, welfare and health, we will continue to fail as a country in our response to the needs of Survivors. We cannot heal the pain Survivors are faced with every day, but we can help Survivors live with their pain and enjoy some semblance of an adequate living standard. Whilst I am not a Survivor myself, the supports needed is not an enigma. 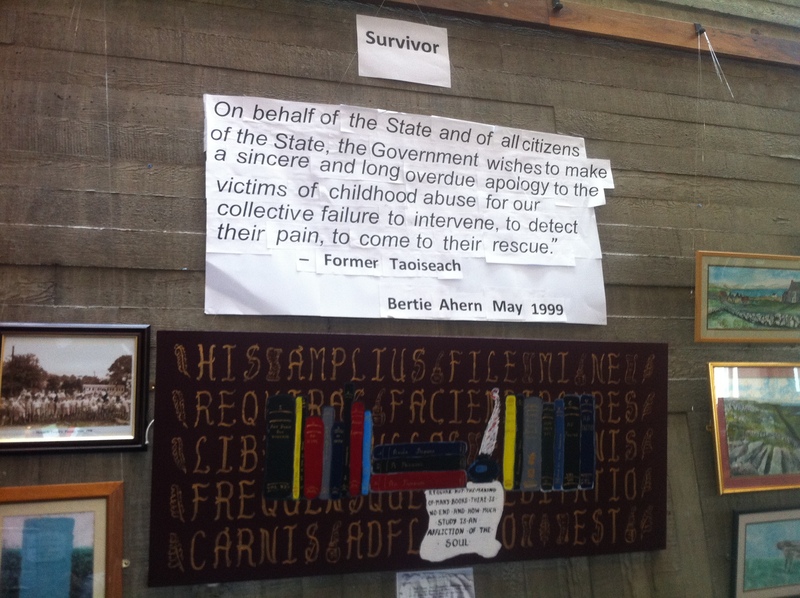 The History of Survivors lends itself to the creation of many vulnerable individuals and families in Ireland and our diaspora and they all have one unique trait in common. The difficulties many are faced with every day of their lives, is as a direct result of our States involvement in their childhood. Surely that very same state should have the same input into their adulthood only on a more positive and unconditional level. As the World Health Organisation defines Health and well-being: “Health is a state of complete physical, mental and social well-being and not merely the absence of disease or infirmity”. Our time, as citizens, to adequately support Survivors (and their families) has to come now. No more can we hide behind "what has already been done". Until every Survivor has access to Priority in Welfare, in Health and Housing we will continue to fail them. It is time we all stood up and offered them their basic human Rights and not force them to go through a system that has failed them all their lives, it is the least we owe them. To all Survivors, family members. Please kindly note that our Cork Office is closed from Monday the 20th of August and will re-open on Tuesday the 4th of September. The Purpose of this is to facilitate Annual Leave for the office staff in Cork. You can still call the office and leave a confidential voicemail, which will be picked up by our Outreach Officer upon her return. Alternativley, please feel free to contact the Waterford office for anything Urgent. The contact number is 051 - 841 819. Additionally to this please note that due to this temporary arrangement there may be an unusual delay in responding to your enquiry, however we still envisage a response time as soon as possible. As always we appreciate your understanding and assistance. We are always commited to ensuring Survivors, their families and supporters of Right of Place Second Chance have access to correct information and as such we are holding a special Q & A Session where if you have a burning question you can directly ask it here on our website and it will be answered by one of our team, relevant to their area. Additionally to this, there has been a number of questions and comments regarding the proposed Monument for Survivors of Institutional Child Abuse that we have answered to individuals, but we will put our responses up also. It is important that if you have a question, to ask it, as there is only one place you can get direct questions answered. Why does Right of Place have no designated Outreach Worker for Dublin? Right of Place does have one Outreach Officer for the Dublin Region, who is based in Waterford City and covers the Entire Eastern Region. Our intention, into the future, is to secure funding to increase this as there is a defined need for one in Dublin. This forms part of our difficulty in responding to queries immediatley as it is often impractical with One office to cover an area that equates to over 2 Million people (albeit Survivor and family numbers are smaller) This forms part of the reason why we respect and appreciate your understanding and patience. We have built a structure, but this structure will only continue to grow. Why does ROP never speak about the work that they do to media? Right of Place Second Chance has always firmly held onto the belief that we needed to ensure our structures were correct, that there was a demand for the service and that in as many (because we cannot resolve all problems we are presented with) before we championed the work that we do. Sure for open and Transparency we have given all minutes of meetings, taken pictures of events and copied our Annual Report on the website but we believe there is a need to show the work that we do - and we have people who are happy to break the confidentiality. As such over the coming months, we will be promoting the actual work that we do, with stories from Individuals so keep an eye on your local and National Press. We would love nothing better! Up to this point we have never used or accessed volunteers outside of the usual few who have always offered it, but we want and need this to change. The overwhelming demand placed on our offices at present means we simply need it. The time it takes to respond to a Survivor and resolve their issue, is getting longer and longer as more people access the services. Our Services are strained and bursting at the seams so a Volunteer policy and document is currently being drawn up with a view to incorporating more volunteers. However this will take time as the sensitive and confidential nature of what we do has to be remembered in any assistance we receive. Why did you agree to get reviewed and what does it mean? Essentially at present the organisation is going through a Voluntary Review Process to decipher and look at how we act as an organisation. TO look at our structures, our information and to see if we are following Law, best code of Practice and that we are open and Transparent. Whilst this is an ongoing review, I look forward to the Report. We signed up to it simply because we wanted to show what we have done in the 18 months since the New Board took over, and allow a review to be carried out. It will have no direct response to you, who access our service, except for you to know that you are dealing with the best. “I believe that the winning entry, Journey of Light, will act as a testimony to one of the darkest chapters in our State’s history and what we collectively as a society allowed to happen to vulnerable children. I hope it will serve as a constant reminder that we must never let such horrendous crimes against children happen again and we must strive to protect all of our children,” - Minister for Education and Skills Mr. R Quinn. Fitting words from Minister Quinn, in reference to the Monument for Survivors of Institutional Abuse. Our congratulations first and foremost must go to Hennessy and Associates of Waterford and Studio Negri, Dublin for their design being chosen as the winning design for the Memorial to Honour Survivors of Institutional Child Abuse. Studio Negri are the architects and author of the design and the concept of the Journey to Light Memorial, Hennessy & Associates are the technicians and author of the drawings and visuals. It is also fitting to congratulate the Committee on an excellent decision and we believe as the monument gains greater understanding, so too will its importance to the generations of Irish men and women who suffered traumatic experiences as children, whilst resident in one of Ireland's Industrial Schools. We know from speaking to the winning team their passion at what was a very emotive and important piece. It was clear from talking to them their understanding that this had to be a fitting tribute was foremost on their minds and they do not take that responsibility lightly. "What a fantastic place for me, for my children and for my father to go to remind us as citizens the devastation that we caused to generations of Irish men, women and Children. The symbolic nature of it all, the story of the children of Lír, cascading through the waterfall. Every fourth stone, protruding with lights on to signify the innocence of one in four children having being abused in this country. The apology from our Taoiseach engraved onto the wall as a constant reminder to us and our visitors that it was not the childs fault, but a failure on behalf of our state. Finally the place where it was decided could not be more fitting. An area in Dublin where we go to remember heros of our state – how telling is it that Survivors of Institutional Abuse are (rightfully) placed in the same area. It is open to the public and yet remains private – an opportunity for those who want to view it and share in its emotion in a gated and secure complex. I left the unveiling with a greater understanding, a greater appreciation of the work carried out by all connected to it and with a sense of pride knowing that in some small way our country would not be allowed to forget and this monument will ensure we never do." - Micheál Walsh, Outreach Manager, Waterford & Eastern Region. 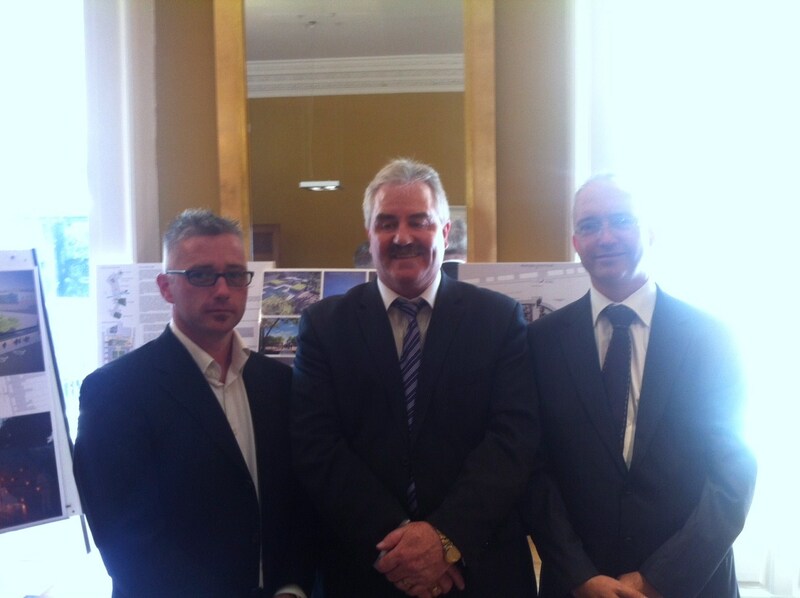 Picture: L - Jim Hennessy (Hennessy & Associates, Waterford) Michael Walsh, Chairperson ROP/SC and André Negri (Studio Negri, Dublin) at the Launch of the Design. The proposed design reinforces the importance of State vigilance in protecting its most fragile members. It is not an attempt to find closure following the revelations of traumatic cases of child sexual abuse in Ireland. 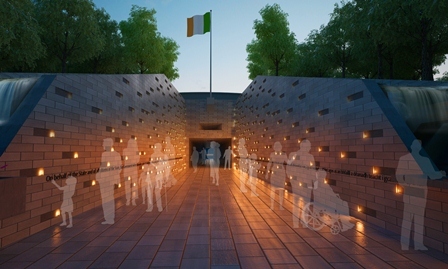 The proposal creates a fluid progression between The Garden of Remembrance, which commemorates those who died for the cause of Irish freedom, with a memorial dedicated to the young victims of abuse. 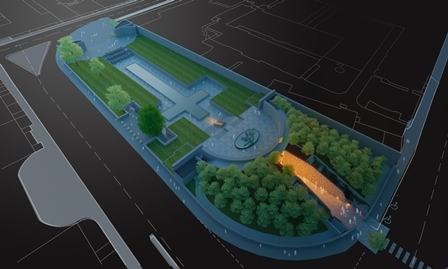 The Garden of Remembrance is composed of a sunken cruciform shape six foot below ground level with limestone walls, a large bronze sculpture of The Children of Lir on a podium and reflection pool along its main axis. The pool has mosaic patterns depicting the Celtic tradition of breaking weapons and casting them in a river to signify the end of hostilities. A cross axis links the forecourt of the Hugh Lane Gallery to the master-plan arrangement of the Rotunda Hospital. 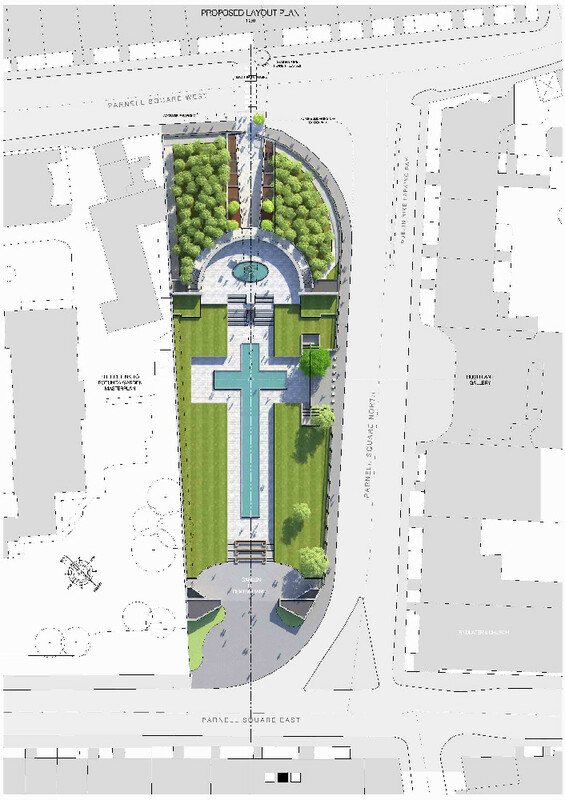 The proposed design is an ordering principle originating where the axes intersect in the centre of the cruciform. 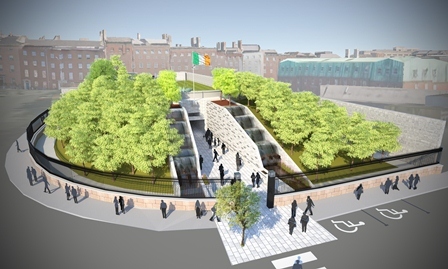 The new geometry diverges to create a passageway through the existing podium steps and continue in line with the Irish flag to form a succession of spaces. The composition includes fossilised limestone walls and paving with a clearly defined forecourt entrance and a pedestrian crossing with semi-mature plane trees. This ensures the spirit and intent of the Parnell Square Framework Plan (2005) is respected. A universal design approach is applied to meet the needs of all users and level access is provided throughout the site for the first time. Central to the design is the element of water which gently cascades over steel plates, symbolising the industrial schools in which many of the abuse cases occurred. The flowing of water represents a healing force for the victims and encourages calmness and contemplation in the viewer. The scale and proportion of the spaces conform to the needs of children and adults. On behalf of the State and of all citizens of the State, the Government wishes to make a sincere and long overdue apology to the victims of childhood abuse, for our collective failure to intervene, to detect their pain, to come to their rescue. The State apology will be inscribed in English and Irish at a child’s eye level on the walls, and in Braille on a bronze plaque at the base of the water feature. An aperture placed below the flag directs a shaft of light to the centre of the inter-connecting space, acknowledging the ethereal sculpture above. A bronze bell inscribed on the floor recalls the conclusion of the legend- the ringing of a bell and transformation of the swans back to an aged human form. While the Children of Lir sculpture signifies rebirth and resurrection, it is simultaneously a representation of lost innocence and a vanished childhood. The proposal compliments the historical setting and centripetally draws in a number of iconic sites within the context. Its auditory, tactile, visual and spatial elements offer a harmonious sensory experience which suggests a movement forward, while deeply inscribed by the knowledge of past events. Above all, it is an ethical link to the sacred ground of the State and a constant reminder that the abuse of our children must never happen again. Please click on the below link to view our Audited accounts for 2011. These are the most recent and most up to date accounts that are available and as advised in the Annual Report they were not published in that because there was a delay in geting them signed off before our Launch. When you click on this link , the Financial Accounts will open in a seperate window. As part of Right of Place Second Chance continued aim to provide the best supports to Survivors of Institutional Abuse and to constantly appraise the value of our work ROP / SC is taking another unprecedented step amongst Survivors groups. Right of Place Second Chance has decided to sign up to and consequently be reviewed under the most recent Code of Governence for charities. Principle Two: Exercising Control Over our organisation. Once this review has been carried out, the areas that we need to improve upon as an organisation will be published for all to view and we will advise on how we plan to improve them and set an agreed date for their implementation. It will make interesting reading to see how we ultimatly fare and will help us to re-evaluate the changes that we have made within Right of Place Second Chance since the New Board took over, just over 18 months ago. Keep an eye on the website for more details as they come. Right of Place Second Chance Exhibition - "Walk A Mile in My Shoes"
Mandy, Waterford City - "How awfully sad yet a testament to a childs inner strength. Unfortunatley not all Survived, shame on us all!" 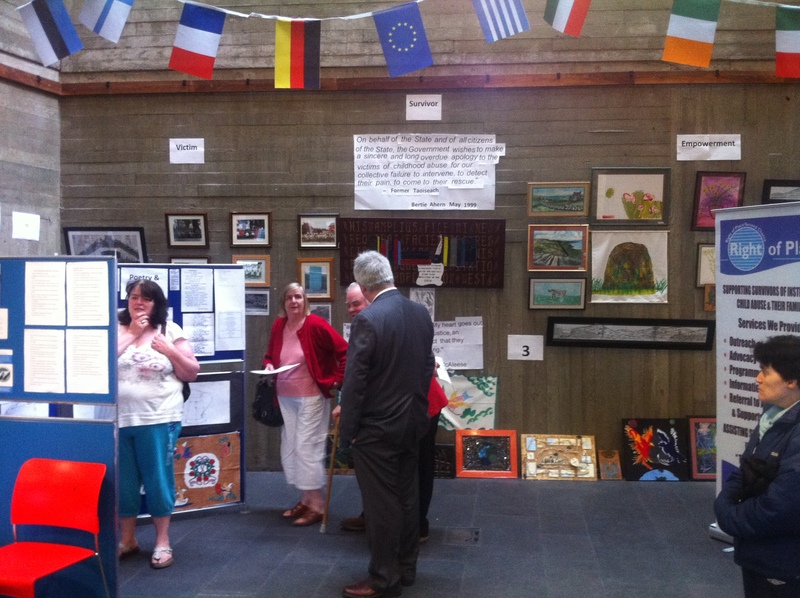 Recently Held in Waterford City was an exhibition by Survivors and their families of their various types of Art, Craft, Poetry, Prose and General pieces of Craft. Michael, Waterford City - "Beautiful Sense of the Struggle and Triupmh over adversity"
Noelle, Kilkenny - "Praise the Lord, all of your wonderful talents can be seen at last. God Bless All of you"
John, Waterford County - "Very Powerful"
It begins to give you a sense of just how wonderful this exhibition was. The Purpose of the exhibition was to develop it into a journey. A way of showing us and the wider public, why these pieces of artwork were such a triumph. We created a pathway that brought people into the mind and the psyche of Survivors, from their childhood to many of their empowered states of mind and creativity now. The Left part of the Wall is the picture above. It depicted what it was like for many Survivors. How could one possibly expect to learn in an institution when you were not even recognised as a name only a number. Aoife, Waterford City - "Inspiring, simply inspiring - Helped show me a Survivors Childhood"
The Second Part of Our Exhibition came onto our pictures. Many of these pictures were donated by Survivors of Right of Place Second Chance and many were harrowing to say the least. There was a caption associated, "Look into their Eyes". As with any of the pictures regarding the institutions the sheer lack of facilities left a lot of people talking. Anne from Waterford City - "Very Powerful"
Gerry From Waterford City - "Very Moving"
The Two Pictures above, formed the centre piece of our Exhibition. We wanted to catch the eye of the wider public by having memorable quotes from our Fromer Taoiseach and Former President. The purpose of this was to highlight the fact that this issue was not an isolated incident. It was not something that was carried out by a small section of our society, but a national tragedy that was recognised at the highest levels within our country. 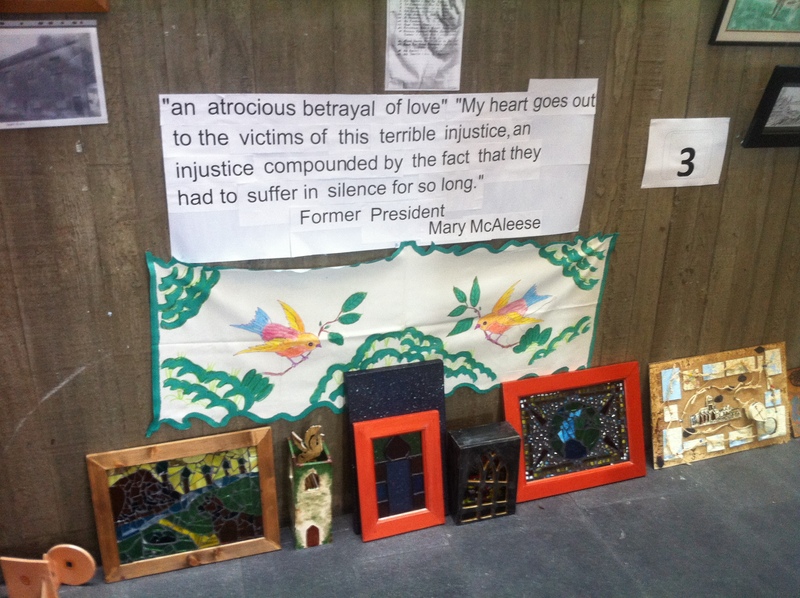 Alan - Kilkenny City - "I was so very moved by your work, my heart goes out to everyone"
We also began to include a number of the additional Art pieces by our Survivors. I am sure you will agree they are fantastic. They began to aid in the national transition in our journey / exhibition to showcasing the talents and showing to our citizens that despite the obsticals they had just witnessed Survivors were Empowered to achieve fantastic pieces of Art and Literature. Maeve, Unknown - "Fantastic and Heart Rending, I never realised the sheer scale"
The Skill showcased in the Above paintings and craft is simply breathtaking. When one considers the history of Survivors, to see the work that they have built and created is simply fantastic. It is a true testament to the dedication and talents through adversity. 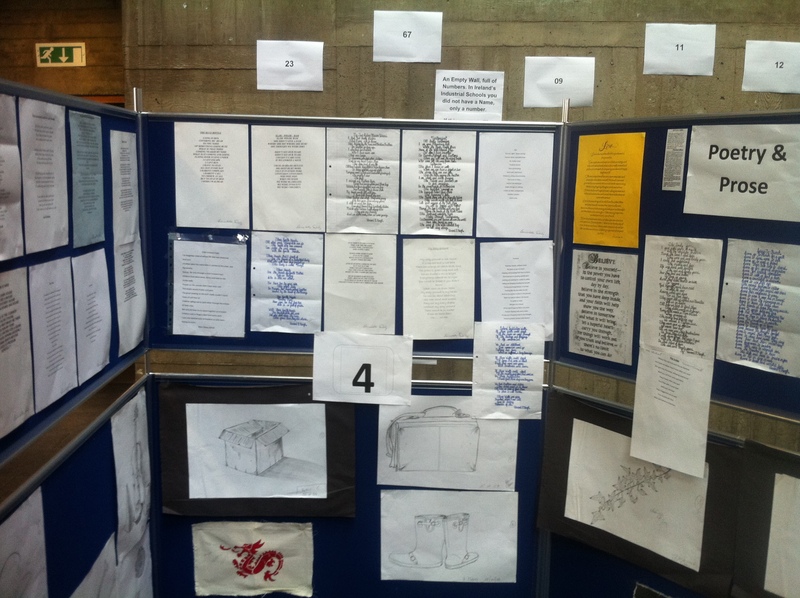 The amount of people blown away by some of this artwork was staggering and long may it continue. Kate, Waterford City - "Great Exhibition"
John, Waterford City - "Empowering!" Anonymous - "Fantastic, Keep up the Great work that you do"
Julie, Unknown - "Was very moved by the Power of your poetry. I felt so sad that any of you had to endure what you did and very inspired by the strength you all Show." Pat, Co. Carlow - "Simply Incredible an thank you for letting us see"
Anne, Waterford City - "Very Expressive and Worthwhile"
Mr. Hearn, Unknown - "Good Work"
Terese, Waterford County - "Great Work"
Trish, Unknown - "Keep up the Fantastic Work"
Eamonn, Waterford - "A beautiful, fantastic way of making sure we never forget"
Shirley, Waterford City - "The Path is sometimes long, hard and never ending. The trials suffered and conquored make us stronger and more able to face what is to come. The path will end... how we face this ending depends on us... Survivors will face their end, THEIR way"
Anonymous - "Wonderful to see talents promoted that were kept silent for so long. I can really begin to feel and understand the pain, but appreciate the ability to come through it with the support you offer and through the works on display"
I hope you enjoyed looking at the exhibition as I know all those that could attend were very moved by it, and the comments out lined abve which come directy from our comment book help to show this. Finally I would like to thank All the staff in Right of Place, especially those Support Staff in the Waterford Office for establishing the exhibition, but more importantly to who the exhibition was about - You the Survivor and your family member. For wanting to display your amazing artwork, poetry etc they were simply incredible and for the many hundreds who viewed over the course of the week, you have left a lasting impression. My sincerest thanks to all those that contributed! Right of Place Second Chance proudly presents the excellent, emotive and wonderful exhibition "Walk a mile in my Shoes"
After offering our Outreach Service to Survivors over the last year one of the many positives of Survivors is the talents that exist through the Arts. There is fantastic Art, emotional yet eye opening poetry that explores the very soul of Survivors and craft that is natural and produced purely from inate talent. This however for many years in many Survivors was one which they never had the opportunity to showcase or even develop throughout their life, however we hope to have changed this in some small way. As a result an exhibition of Survivors works was developed to heighten awareness to the general public of the talents that exist among the Survivor population and indeed their family member, additionally to the experience many suffered. 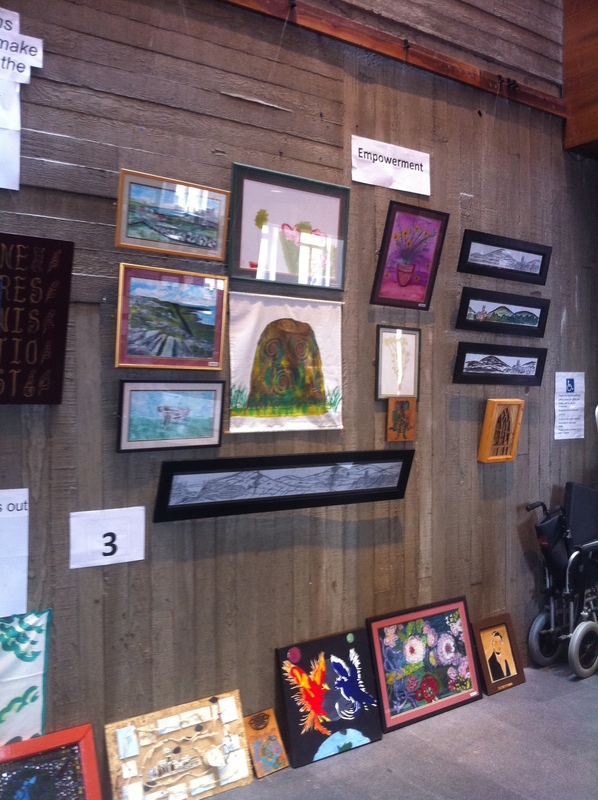 Proudly displayed is work by Survivors that allows our citizens see the talents that exist and already the feedback has been excellent. To all those that contributed, by sending in their pieces of work, we have no need to be thanked, it is us that should be thanking you for allowing us the opportunity to showcase your work. For anybody who has not seen the exhibition I would say if you can make it to Waterford before Saturday evening, please do and celebrate and show solidarity to your fellow Survivor for their fantastic works and their fantastic achievements. Already we have been asked to develop it nationally and allow others across Ireland to experience the exhibition, so keep your eyes open into the future. 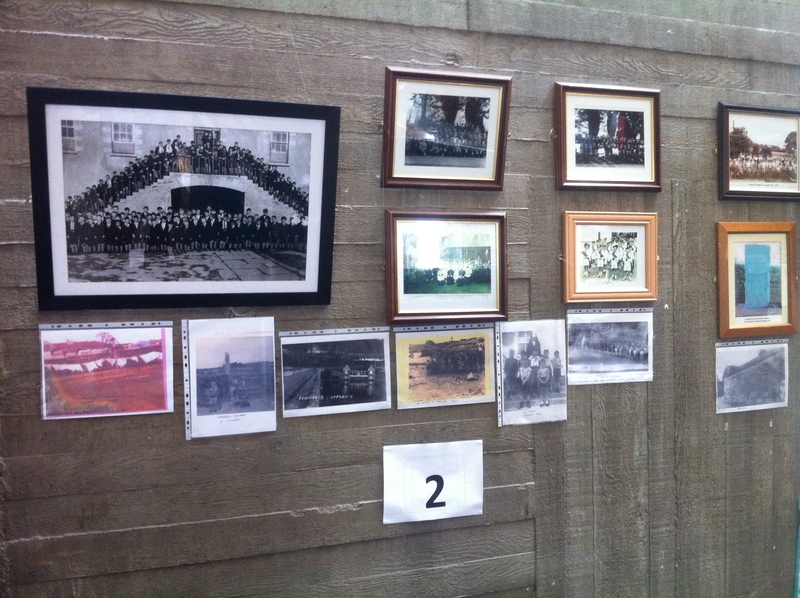 Pictures and videos of the exhibition will follow. If any of you have any information regarding either yourself or a fellow Survivor who spent time in the above institutions and are interested in re-connecting with former Survivors from the same institution, please feel free to contact any of our offices and we will put you in touch. Alternativly, should you wish please contact our Head office in Cork and ask to speak to Ann Marie Crean directly (Outreach Manager, Cork & Kerry Region) and she will be happy to discuss this in more detail.